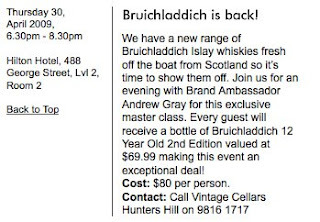 Members, I have come across the shown whisky event being held at the Hilton in Sydney on Friday, 1st May 2009. It is being run by Vintage Cellars with the details above and here. Bruichladdich is an Islay distillery, but known not to be as peaty/heavy as the more renowned Islay distilleries. Don't really know what to expect, but I have already booked a couple of tickets for the 1st of May tasting. If you are also keen to go, give the guy a call (ph: 9816 1717). Tickets are selling FAST. The date shown in the notice above is the 30th April...however due to demand they are running another class on the 1st May. Be quick if you want to come along!